The Kiwi Bottle Drive is up and running. 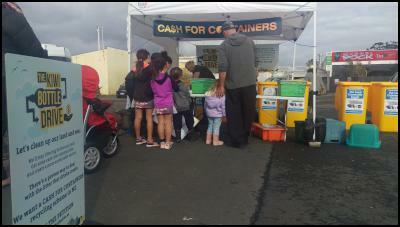 It’s a campaign to bring back a Container Deposit Scheme (CDS) in New Zealand. It would apply to beverage containers (glass and plastic bottles and aluminium cans), with a 10 cent deposit on purchase and refunded when the container is returned for recycling. Kiwi Bottle Drives are a great family affair and good learning experience for the whole community. Huge benefits await if such legislation were enacted. Current recycling rates for beverage containers in New Zealand are less than 40 percent and possibly as low as 25 percent. Recycling rates would more than double with such a scheme. This is significant as some 46,000 tonnes of beverage containers are currently discarded into the litter stream, waterways and landfills each year. The Incentive to Recycle, a report prepared by Envision New Zealand Limited in 2007 and updated in 2015, sets out a practical plan to implement a CDS here based on best practice overseas. A managing agency would be established by the beverage industry and other stakeholders to coordinate the flow of materials and funds through the system. Local groups would set up convenient drop-off points – there’d be more than 200 around the country – where the public can receive funds for their containers. More than 2,000 new jobs would be created, providing social and economic benefits to the communities where the drop-off points are located. City and district councils (and ratepayers!) would benefit through an estimated $26 to $40 million annual savings in litter collection and waste disposal costs. At Local Government New Zealand’s last AGM a vote to endorse such a scheme and requesting that the Government require industry to develop and implement it within two years was passed, with 90 percent of members in favour. You’d think Central Government would embrace the CDS idea. It’s a market-based instrument, self-supporting once established, and a job creator at no cost to Government. It would save ratepayers around the country money and go some way to protecting the marine environment – a sound investment given the increasing importance of tourism to the economy if for no other reason. It’s also bound to be popular with the New Zealand public – not a bad thing in an election year. Overseas schemes consistently show approval ratings above 90 percent. But, nope, the National Government has steadfastly opposed such legislation since taking office in 2008, favouring voluntary programmes over regulation. The packaging and beverage industry lobby groups have exploited the voluntary regime with heavily promoted initiatives – some funded by the Government, make that the taxpayer, via money received from the Waste Minimisation Fund. These voluntary schemes have had virtually no impact on increasing recycling rates for beverage containers. Many public recycling bins are so contaminated it all goes straight to landfill. Independent recycling specialists say these initiatives have one main purpose: to ensure the industry is not legally obligated to take responsibility for the whole lifecycle effects/costs of the products they put into the market. It’s worth noting here that the cost of a mandatory CDS to the packaging and beverage industry – or to purchasers if they passed on the cost – would be less than one cent per container. A legislated Container Deposit Scheme is in place in more than a dozen enlightened countries and, with them, recycling rates of 85 to 98 percent are routinely achieved. It’s long past time New Zealand joined the party. Gord Stewart is an environmental sustainability consultant. He does project work for government, industry, and non-profit organisations.